Adelphi University included a Build-A-Bike team building event for the campus’ student leaders recently near New York, New York. The group of students were mainly officers from clubs and organizations on campus. Many of them promote and engage in philanthropic activities throughout the school year, so Build-A-Bike as a philanthropic team building event was right up their alley. Adelphi University’s main campus is located on Long Island and has near 5,000 students. The staff at Adelphi University wanted to give the student leaders a little extra time talking about leadership and good communication skills, so we conducted a one-hour session up front on seven principles for practicing building trust and rapport. The students were encouraged to think about ways they could use these principles in their student organizations to foster and promote greater participation. The Build-A-Bike portion of the program uses a series of challenges and activities to encourage team building. Ready to be out of their seats and moving around, the students brought lots of energy and enthusiasm to the activities in this portion of the program! One of the students that acted as a judge exclaimed several times that this was by far the best team building event they’d ever done! 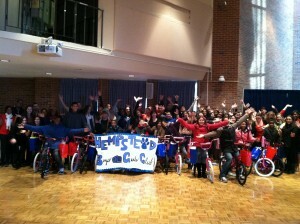 The group built 18 bikes, which were donated at the conclusion of the program to kids from the local Boys and Girls Clubs of Hempstead. The kids brought in a banner and presented the group with certificates of thanks. It was a very special experience.